CARLSBAD  As a high school senior planning to major in business in college, Tanner Clark will be crunching the numbers this fall. As the starting quarterback for the La Costa Canyon football team, Clark hopes to avoid being crunched while putting up the numbers. As a third-year varsity starter, Clark brings experience to the line of scrimmage for Mavericks head coach Sean Sovacool, whose team was scheduled to open the season last week against Whittier La Serna. “Tanner already has 23 games at the varsity level before his senior year,” said Sovacool, in his seventh season at LCC. “He played eight games at wide receiver as a sophomore before taking over at quarterback after our starter was injured. Clark also brings a 4.2 grade point average to the table, and he is counting on his smarts to help himself and his team improve. 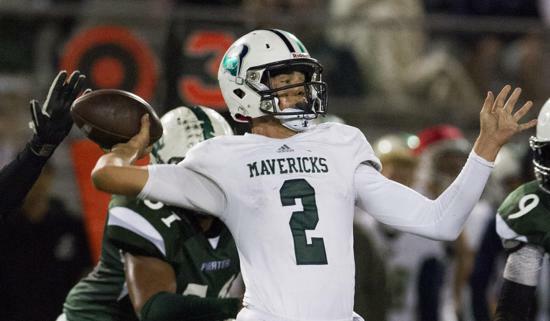 The Mavericks entered the postseason last year with optimism, but those hopes were dashed by a 47-0 loss to Mission Hills in the first round. Clark believes he may be part of a team ready to take the next step. The Mavericks were ranked No. 7 in the Union-Tribune preseason football poll. “We definitely have the team chemistry,” he said. “The juniors are all coming together, and the returning starters are filling in their spots. As a multipurpose threat last season, Clark accounted for a combined 1,703 yards passing and rushing while scoring 18 touchdowns. He has beefed up his 6-foot-3 frame to 200 pounds, and it would not be much of a surprise to see Clark lined up wide again at receiver from time-to-time in 2016 as a pass-catching target when junior quarterback Jake Neufeld takes the snaps. A football player since beginning YMCA youth competition at age 5, Clark hopes to continue his gridiron career and education at an Ivy League school upon graduating from La Costa Canyon. Clark and his teammates had a preseason test Aug. 19 with a scrimmage against Rancho Buena Vista. And if passing, running and catching the ball weren’t enough, Sovacool indicated he has even more plans in store for Clark.